I've come up with something new. 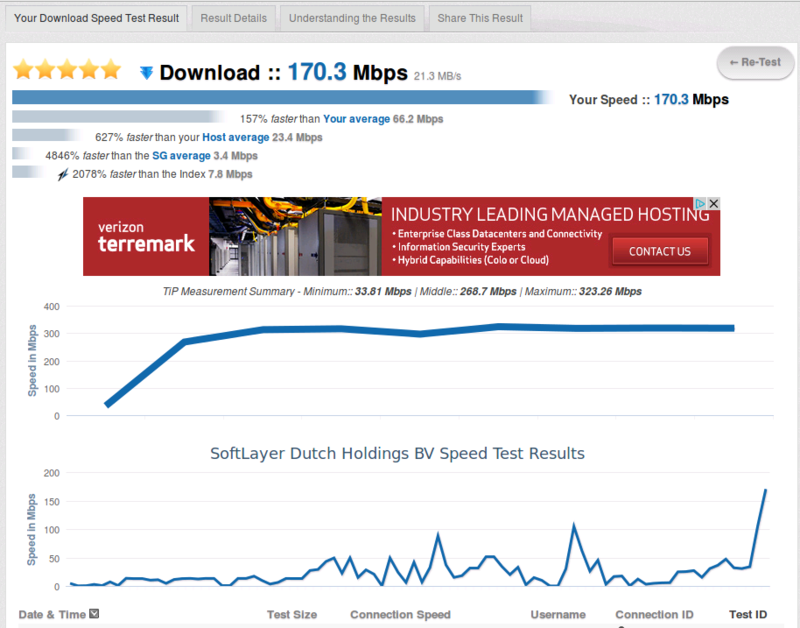 Personally I think that it adds a new demension on your download speed test results taken here. I devised a way to take measurments during the test, using those numbers I then plot a graph of the path of the download speed. 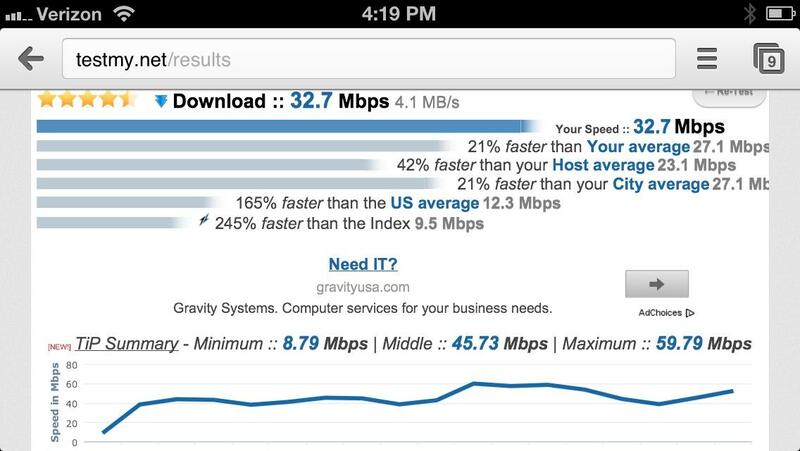 Check out these insane speeds all the way from Singapore to Dallas TX. 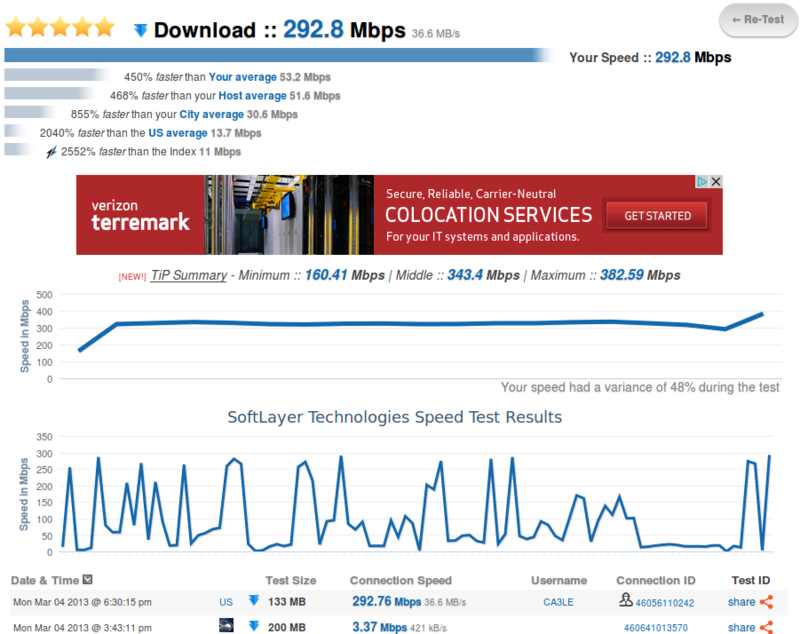 Notice how the dip at the start of the test brings the overall score down to 170Mbps when it actually topped out at 323 Mbps. Here's a speed test result where I purposely ate up my bandwidth periodically durring the test to show how dramatic it can be when there's an issue. I think this extra set of data is going to be very helpful for troubleshooting. This is in early stages, I'm only doing it on the default Texas server for now. I wanted to nail down the proof of concept before I expanded it to all the mirrors. I plan on expanding this to take more measurments and also log the information to a database. So you'll have not only a history of your tests... you'll basically have a history of tests within tests. You can really tell a lot about what happened durring the test with this extra information. I hope you all like the idea. Side note, with the addition of logging TiP stats I'll also add a whole new array of datapoints that will be logged, such as browser and OS. 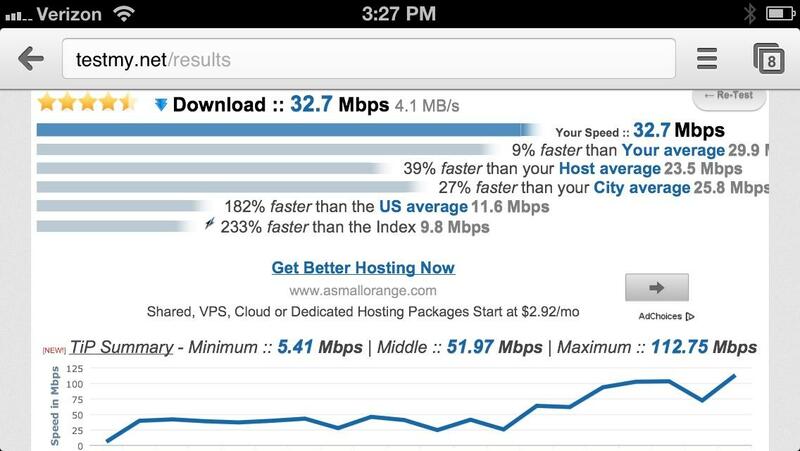 So average speeds and ranking of browsers and operating systems will be possible. So keep an eye out for that in the near future. I'm only semi-skilled here. What does TiP stand for? 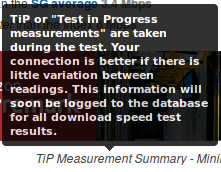 And why are the TiP measurements different from the Download Connection Speed? If you hover over it you'll see explainations. It stands for Test in Progress measurments. It helps to show variations in the speed durring the test. Dammit ,I guess I got to move to Singapore , but then maybe Singapore is v. close to Dallas , ? to be honest I have given up speed testing full stop , too many varibles IMHO . BTW Pgoodwin, from memory TIP stands for "trouble in paradise ," maybe I am wrong on that ? 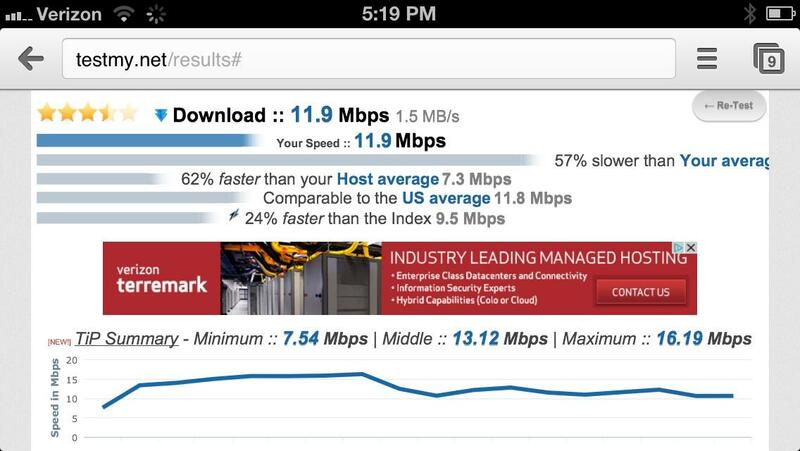 That was on an iPad with Time Warner's latest 15 Mbps down/ 1 Mbps up service upgrade as of January this year. The variation in the TiP data points is about what I would expect. 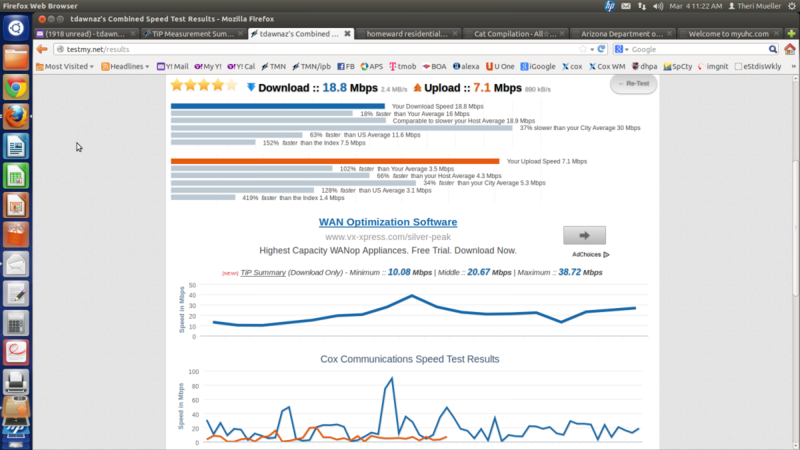 With this ISP I see quite a bit of variation depending on prime time vs non-prime time. 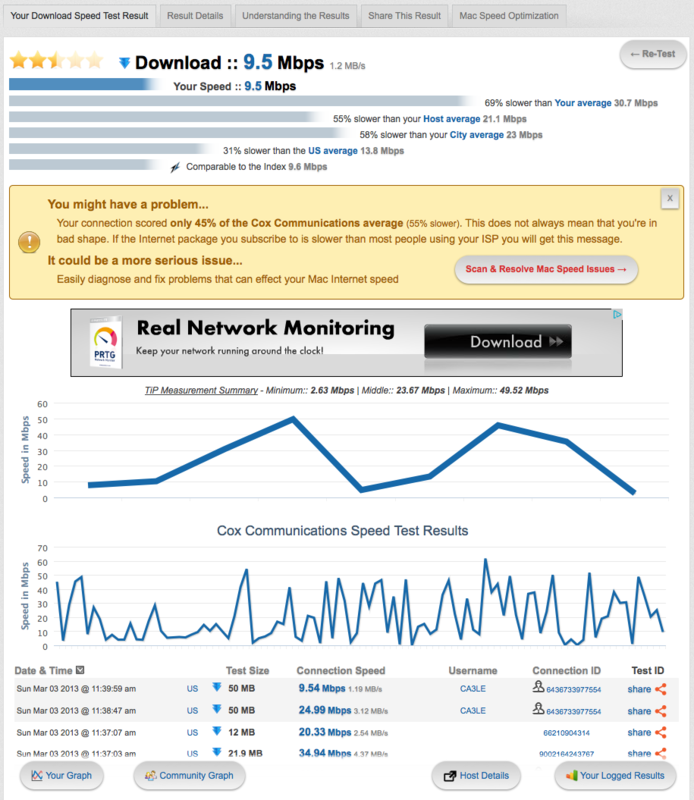 My "normal" comdition extremes are about 8 to 18 Mbps average download speeds depending on time of day, with about 15 Mbps being my new long term average. It was only 8 under their old service last year. 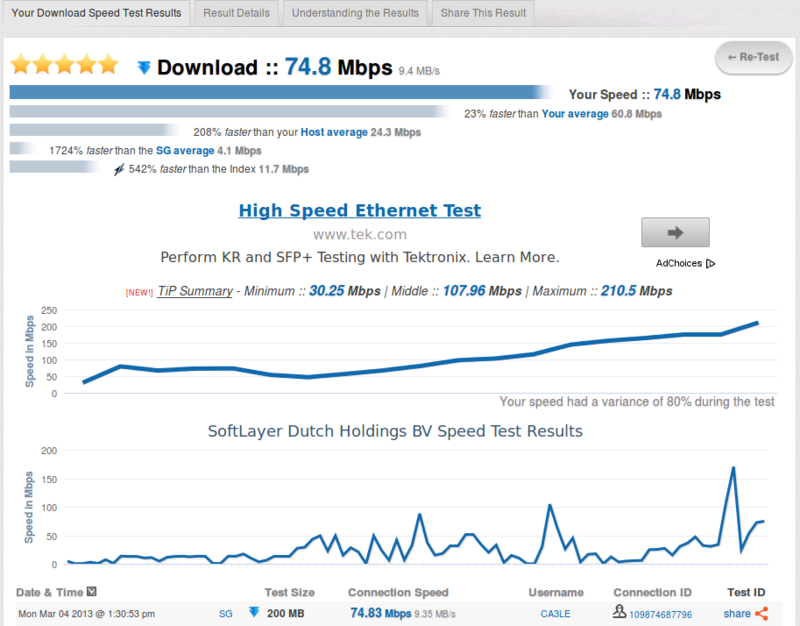 Peaked at 63Mbps! I would have never known that before. Hopefully it will help some people. Can't wait till I start logging this information!! I modified this to record and plot 20 points durring the test. Also, when you hover over the graph you can see how much time had elapsed and how much data transfered at each point in the test. Kind of amazing that you can use a tablet and get speeds 500 times what we used to get on the fastest home computers not all that long ago. And Biggles: China probably owns 1/2 of Dallas. It is amazing... Check this out. My iPhone5 on wifi. ...in the palm of your hand. I can only imagine 20 more years from now. Another one... Screenshot this time. 100MB test.. The slow start really hurts the end result. Very fast bits in there. I'm surprised. That is pretty amazing. I only have an iPhone 4 and an iPad 2. 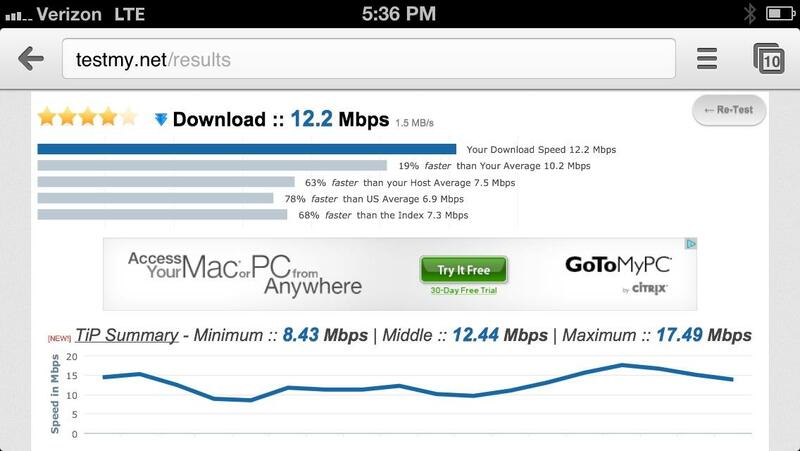 My download speeds avg about 12 Mbps on the phone, and about 14 on the iPad. Actually, mine were inflated. I made an adjustment that makes it more tolerant to bursted speed do to the client end. I'm sure that the way the iPhone processes was messing with that result. It was smoothed out by expanding the polling time. Here's a more realistic result. What I like about LTE is the responsiveness. When I've got good coverage LTE loads sites faster than my wifi with 150 Mbps Cox. In certain areas I've seen things load so fast it seems like it predicted that I was going to click that. LTE is awesome, funny thing is, no provider is even tapping the potential speeds it's capable of... We have a lot to look forward to. This result was taken at my house and I only get half signal here. 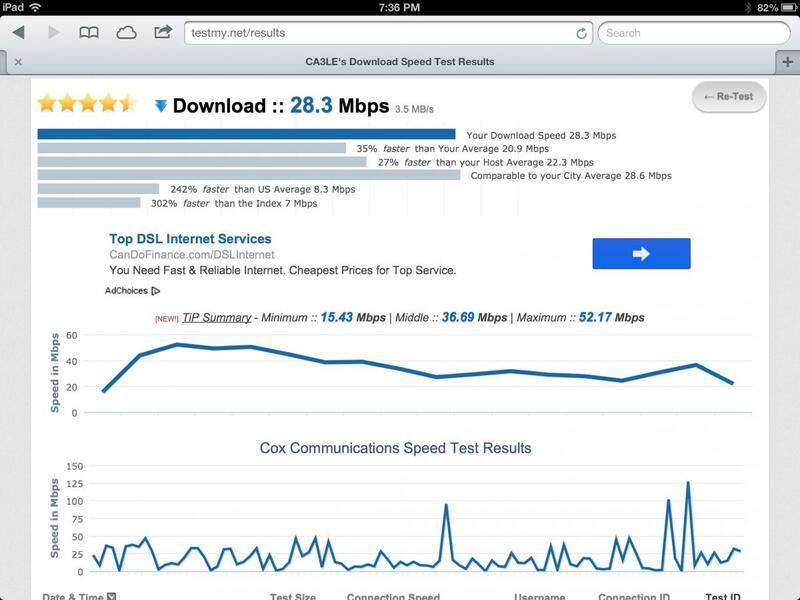 In really good areas I've seen over 20 Mbps. My bad, that one was wifi... Really far from the base. 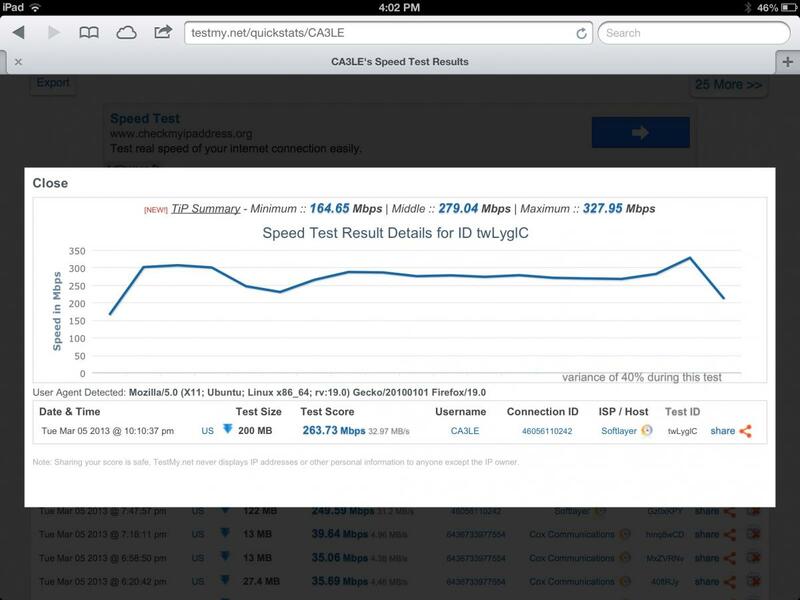 Here's the LTE result. iPad again, after the revision. Can you guys see how that data can be helpful? By the way... side note. I personally like sharing scores by using the "Result Details" tab instead of the score sharing tab. I think the results details with a screenshot is a better method of sharing for forums. Don't you? Alright... TiP Data is now being logged. Click on the test ID in your results to get the details from each result. Later I'll make it so you can just hover over the result to pull that information... and within 24 hours I should have it expanded to all the mirrors. Okay, now if you click the testID in the database results it opens within the page to save time. Click close or click the grey background to go back. This has been expanded to the mirrors.